It was a Hell of a day. And by “Hell,” I do mean, Hell. First I had a car accident, not my fault. The wench hit me, knocked off the front left fender of my car and drove away. Fast. I was on my way to the track, actually to visit Trainer, Abigail Adsit. I wanted just to give her a hug, then to beat it out of her barn. I didn’t want to bug her, just to show some support for the Hell she’d been going through since the horrible incident yesterday. As most of you know by now, her horse, Lavender Road, started a journey yesterday that ended in her return to Heaven today. It’s too long a story, and too complicated–and way too sad–so I’ll just ask you to Google it. I’d heard reports both that Lavender had fractured neck vertebrae and that she had brain damage. Somewhere in their are the facts. Oh, yes, and internal heat stroke played a role. it’s raised to the Heavens. We all recite the phrase, “I love this sport, but sometimes I hate it,” at least once a year. There are many haters and detractors on the perimeter of horse racing–some even cleverly disguised as insiders. Like sharks around a bleeding puppy, they look for situations like this to attack the sport and everyone involved with it. Their special victims are those closest to the horses. They delight in shredding Trainers, owners, jockeys–and grooms. No one is too big or too small to escape their Cuisinart in their effort to bring down a sport that has been part of the human experience for at least 5,000 years. Abigail Adsit did not send out her perfect f!lly to die. She did not put her into a race where the pace would be so fast that the f!lly would kill herself trying to keep up. Her owner did not–would never–toss his beautiful grrrl into a field where she did not belong, or pressure her Trainer to do so. Junior Alvarado did not whip her relentlessly in an effort to beat any horse. Dear Lavender Road never made it into the gate. She did not die trying to please the humans in her Life. If there’s any mercy to be seen in this sad, sad situation, it’s that the haters will have to wait for another day to nail a human to the Cross. Simply put–however it played out–Lavender’s body rebelled against her. Period. And those of us who love horse racing and often hate the results–tonight we don’t have to recite that we hate the sport. We still love the sport. We love our horses even more. And, like a true community,horse racing is gathering ’round Abigail, Mr.Kallenberg and Junior tonight, via social media–in person–and with enough prayers for comfort to calm an ocean. 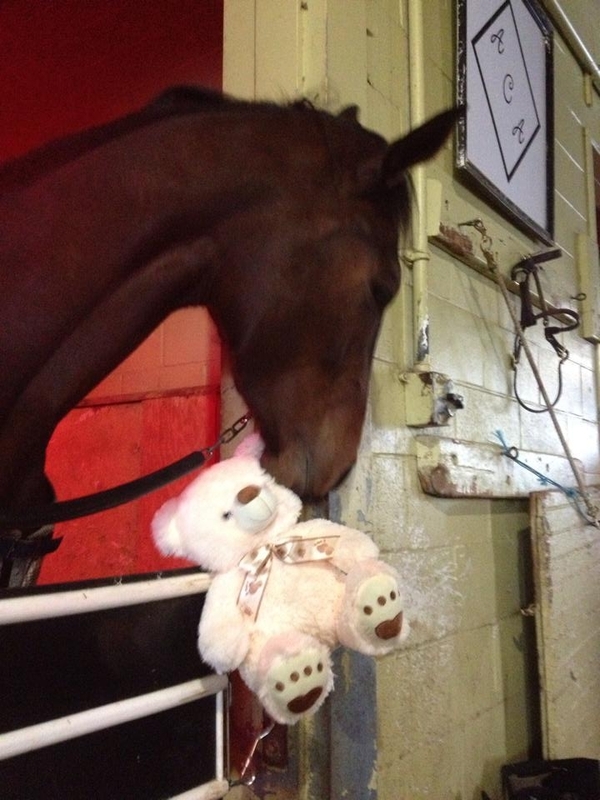 Look at this picture of Lavender Road and her teddy bear. Look at this picture, and yes, you’ll probably cry. You’re crying because you realize that another beautiful soul has left its frail earthly shell, and soared freely back toward Heaven. You’ll cry because,like me, you know that horses have emotions–and clearly, Lavender loved her teddy. Those who deny that horses or other animals have emotions are idiots. Not scientists, not pragmatists–just idiots. Lavender Road loved her teddy bear. She loved Abigail, Mr. Kallenberg, Junior and everyone in her barn. Lavender’s physical body is gone, but surely she leaves behind a beautiful heart-full of Love. She gave so much Love to all who met her–even to me–and we are so grateful. Everyone in her circle is aching tonight, but I hope that they–that we–can remember that it really is better to have loved Lavender and to have lost her, than never to have known her at all. Lavender Road lived on this Earthly plane a brief three years, but in those years she made a lot of Love. She gave and gave, and now that Love translates back as grief in the hearts of all who knew her. My heart is shredded, and I was just a friend. But if I had the chance never to have met her–never to have experienced her deep, gentle eyes and soft, sweet body beneath my grateful hands–I’d take the pain. Lavender Road, as all the horses we lose, remind us over and over again that Love hurts like crazy sometimes. But living without it would be Hell, itself, for Hell is the absence of God. And if ever a horse reminded me of the grace–the kindness–the purity–of God, it was the late, precious, swift and good Lavender Road. Thank you to Amira Arenas-Chichakly, with love. Next Article Truth + the Love of Horses = Healthy Horse Racing. 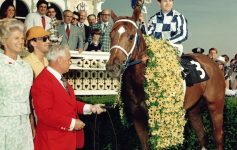 Secretariat’s Authenticated Preakness Garland to Be Auctioned for Charity. 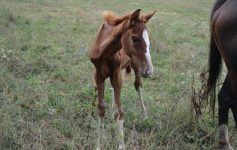 Please Help Stop Gerald (Jerry) Herron, a Horse Killer. NOW.